This dish was healthy, flavorful, and pretty. When I saw this recipe on Pink Parsley, I knew immediately I was going to make it. 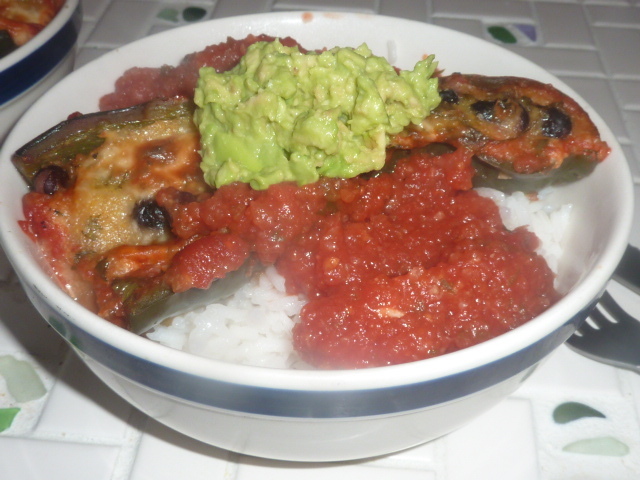 I absolutely loved the idea of a cornmeal stuffed pepper – the flavors are very similar to chile rellenos, but rather than stuffing the pepper with cheese, battering it, and frying it, this is baked in a delicious, spicy tomato sauce. It also saves the step of roasting the poblano prior to stuffing, because the pepper becomes tender and roasted while the stuffing heats. We both really liked this dish. In the future, I think I will add a few tablespoons of lime juice to the stuffing for a little touch of citrus and acid or perhaps use grapefruit juice in place of the water. Overall, though, this was a very hearty vegetarian main filled with big, bold flavors that I will certainly be making again. Combine tomatoes, jalapeño, onion, and garlic in a food processor. Process until smooth. Gently stir in half of cilantro (about 2-3 tbs.). Season with kosher salt and freshly cracked black pepper. Pour into a baking dish and use a spoon to cover evenly. In a medium bowl, combine beans, cornmeal, 1 cup cheese, remaining clove of minced garlic (from sauce part of recipe), cumin, cilantro, and the water. Stir to combine. If too loose, add slightly more cornmeal. Evenly divide stuffing among peppers. Lay, stuffing side up, in a single layer in the baking dish. Top with remaining 1/2 cup cheese. Cover with aluminum foil. 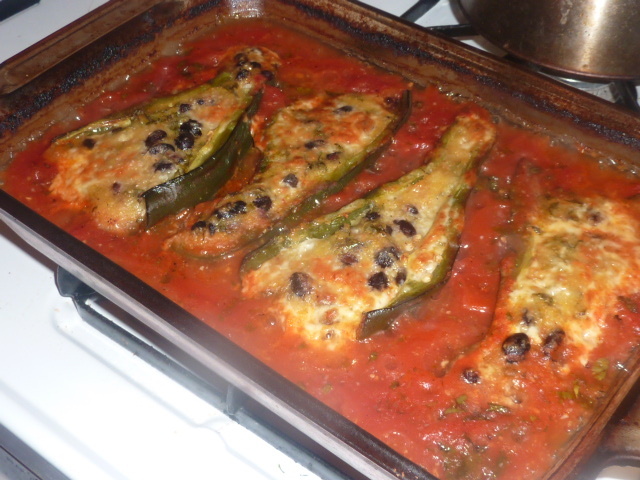 Bake 45 minutes or until poblanos are tender. Remove foil and bake an additional 10-15 minutes until cheese is golden brown. Let sit 10-15 minutes before serving. Serve over white rice with a dollop of smashed avocado.